Our discussion group in Skipton is led by Gina Lazenby. Click on our Facebook page to keep up to date with meetings, or contact Gina directly at ginalazenby@me.com. Meetings are currently held at Gina Lazenby’s Healthy Home in Skipton town centre. Alternate venues are sometimes used, so do ensure to double check whenever you attend an event! Nick’s subject is about the difficulties some of us can have in feeling good about ourselves. His premise is that when you understand yourself more deeply, any insights you gain will help boost your self esteem. Nick’s background has been in acupuncture and Chinese philosophy having founded the Northern School of Acupuncture over 30 years ago. Moving on from simply working on people’s individual health and well-being, Nick studied the patterns of people’s lives through his deep understanding of thousands of patients. This, together with his knowledge of the eastern study of five elements led to him creating the Five Institute where he offers a unique profiling service called the Vitality Test. You go online and the results of the questionnaire provide you with extremely valuable insights into what drives and motivates, as well as what might predispose towards different ways of being. Add to this his knowledge of the changing energies of each year, using the 12-animal system of Chinese astrology, and you can get very powerful information to guide you in understanding not only yourself, but also how things change in cycles. Knowing where we are in a particular cycle and how we can adapt is extremely helpful. Our invitation is for you to take a few moments before the event on Wednesday and do your profile for free on the Five Institute website. 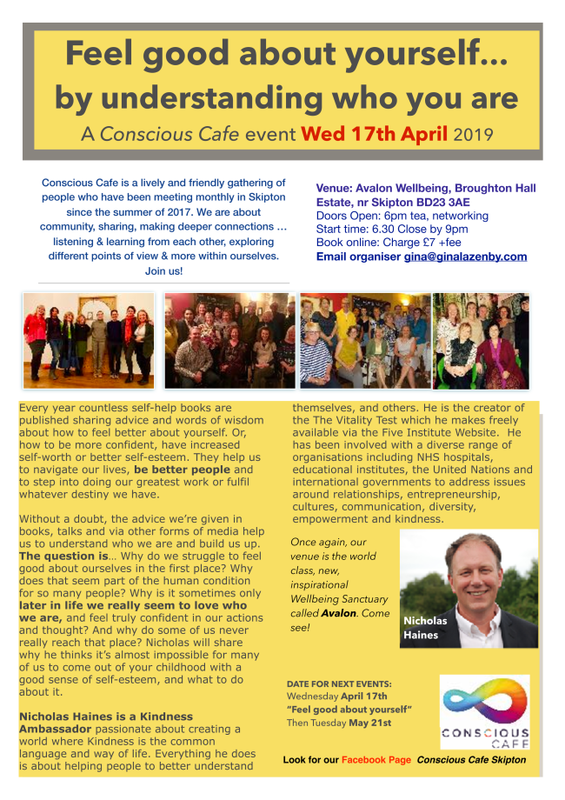 Bring the insights with you on Wednesday …and be prepared to receive some brilliant wisdom that will indeed make you feel good. I always find Nick’s insights immensely helpful personally. Forewarned is always forearmed, as they say! It is going to be a great night. Book in advance to save money on the door. Nicholas Haines is a Kindness Ambassador passionate about creating a world where Kindness is the common language and way of life. Everything he does is about helping people to understand themselves, and others, better. He is the creator of the The Vitality Test which he makes freely available via the Five Institute Website. Nicholas has been involved with a diverse range of people and organisations including NHS hospitals, educational institutes, the United Nations and international governments to address issues around relationships, entrepreneurship, cultures, communication, diversity, empowerment and kindness. His latest books are ‘The Story of Boxes, The Good, The Bad and The Ugly’. Co-authored with Rúna Magnúsdóttir and The Art of Kind and Loving Relationships. Investing in Yourself – how important is it to prioritise self care? How do you create a Circle of Trust? Can we afford to care about people and be kind?